allows evaluating the efficiency of trading for the specified period of time. 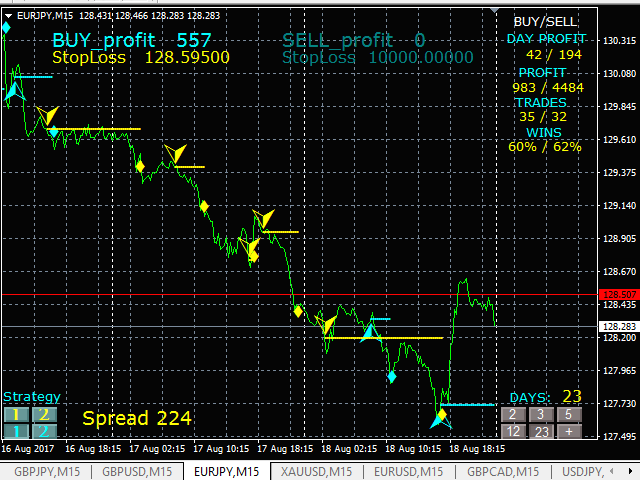 Recommended currency pairs: GBPJPY, GBPCAD, GBPUSD, EURJPY, XAUUSD, USDCAD, USDJPY, EURUSD. 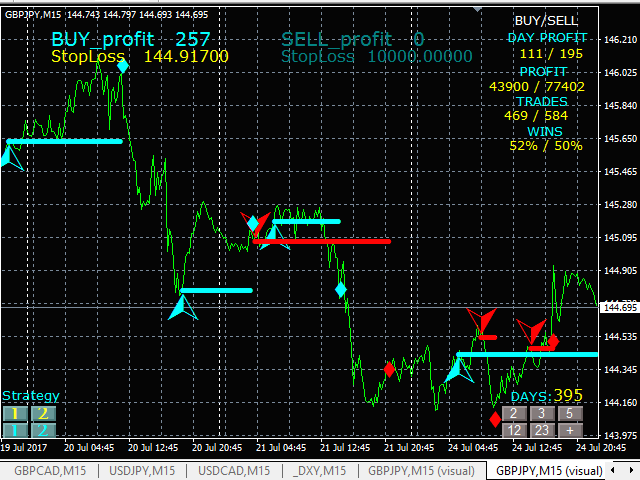 The system includes three trading strategies (Strategy 1 is activated by default). The other strategies (2 and 3) can be selected suing the buttons located in the indicator window. 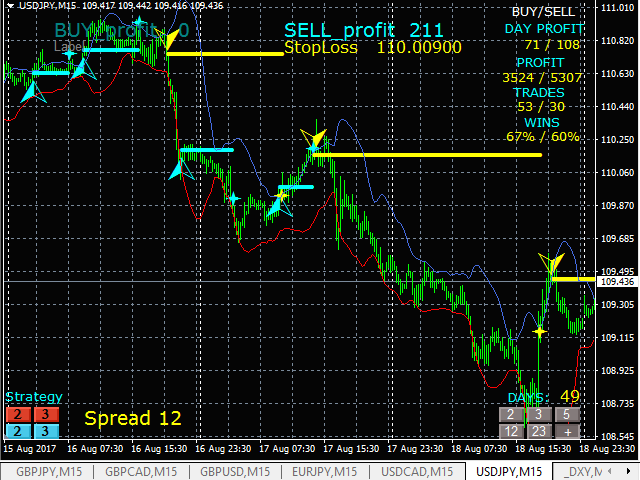 The indicator window shows the trade statistics, which allows instantly adjusting the system and selecting the most profitable currency pairs to trade. The BollingerBands indicator is integrated into the system, which is one of the best indicators of technical analysis. 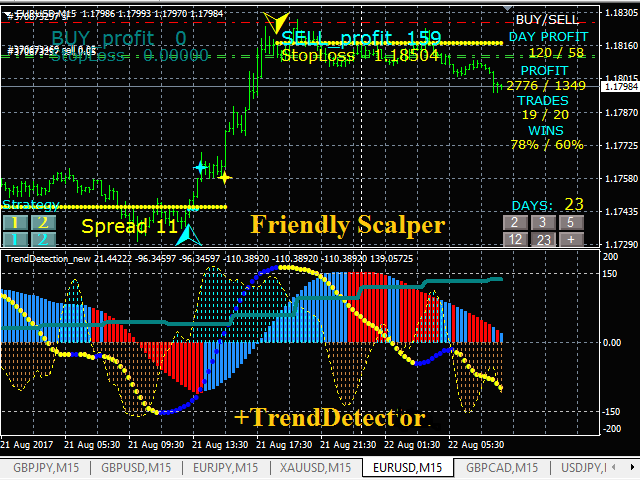 The FriendlyScalper trading system is complemented by the TrendDetector indicator, which helps in visual evaluation of the current market situation and increases the efficiency of trading (see screenshots). 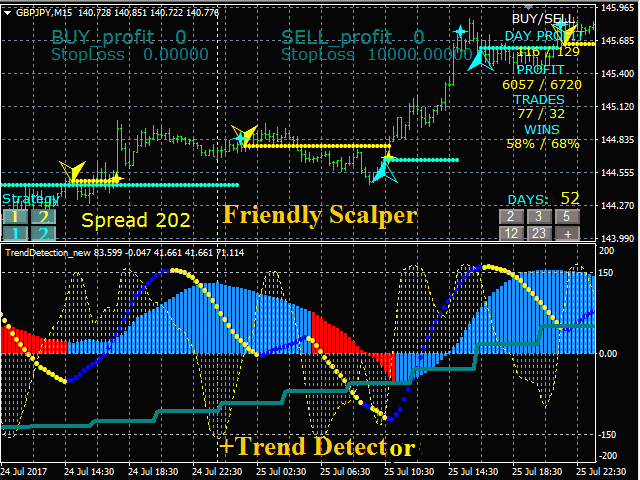 Since the testing mode imposes restrictions on evaluation of all system features (buttons are disabled in the testing mode), it is recommended to evaluate the efficiency and convenience of FriendlyScalper, quickly master and optimize the system in real mode. For this purpose, at the initial stage, the monthly rent is set to minimum. ALARM - enable/disable alerts on trade signals. show_statistics - enable/disable the display of trade statistics. BollingerBands - enable/disable the BollingerBands indicator.